Сервисом alaTest было собрано и проанализировано 44 обзора для HP Envy Rove 20. Средняя оценка этого товара 3.7/5, в сравнении со средней оценкой 4.1/5 для других Настольные компьютеры. Комментарии о дизайне и удобстве использования в общем положительные, дизайн и удобство использования также получили хорошие комментарии, в то время как есть негативные мнения о размере и надёжности. Мы проанализировали оценки экспертов и пользователей, дату выпуска продукта и другие факторы. По сравнению с другими товарами из категории Настольные компьютеры, HP Envy Rove 20 получил alaScore™ 91/100 = Отличное качество! Though relatively inexpensive and boasting a good display, the HP Envy Rove 20 remains a poor value. Consumers can buy a 20-inch all-in-one and a tablet for less than this PC's base price. The HP Rove 20-K014us portable all-in-one desktop PC has both the innovations and problems that come with being a first-generation product in a nascent category. Portable around the house. Huge screen for a portable. Ultrabook performance in a tablet form factor. Wi-Di compatible. Dual-band 802.11 a/b/g/n Wi-Fi. Comes with Monopoly and other touch games. Limited ports. Uncomfortable wireless keyboard. Not full 1080p HD. Somewhat hefty. Lots of pre-loaded software. It's big and heavy, but this 20-inch hybrid all-in-one is the least expensive way to get into tabletop PCs. The ; costs a bit less than some other tabletop PCs, includes great audio, and runs long enough to watch a couple of movies without being plugged in. It's heavier than some comparable big-screen systems, uses a lower-end CPU, and the 20-inch display isn't full HD. HP's entry in the growing tabletop PC field, the 20-inch Envy Rove 20, is a fun family PC, but it really should have a full 1080p display. The HP Envy Rove 20 is a well-rounded, beautifully put together portable bundle, even if it's not something that people will use much as a true portable. 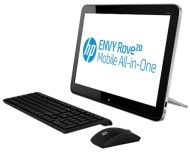 HP's Envy Rove 20 has a nice screen and a wonderfully designed kickstand. But despite a new Haswell CPU, this nearly $1,000 oversized tablet/AIO underperforms and suffers from some design flaws. Le HP Envy Rove 20 s'utilise comme un PC tout-en-un ou une tablette XXL, selon vos besoins du moment. Et, grâce à sa batterie intégrée, vous pouvez vous en servir partout dans la maison. HPs Mega-Tablet Envy Rove 20 kommt mit 20-Zoll-Display und Touchscreen, Dual-Core-Prozessor aus Intels vierter Core-Generation und Windows 8. Im Test zeigt sich, wie leistungsstark der semiportable All-in-One-Konkurrent des Sony Vaio Tap 20 im Alltag ist.